There is uncertainty of the birth year of John Hudnall (I). One scenario indicates a birth year of 1606. A 2nd scenario indicates a birth year of 1616. Given the convention that Jr. was used in that era to designate the younger of two men with the same name, and does not necessarily indicate kinship, it is believed the first six children are from one of the above marriages and the last child is from the other. One might question how Ambrose and George could be siblings considering the proximity of their birth dates. But remember, this was under the Julian calendar where the year did not change until March 26, and the date of George’s birth by the Gregorian calendar in use now is actually 21 Feb 1614, some seventeen months after Ambrose was born. There is no evidence that can be used to determine which family is which fro the above information. The only useful information that can be derived is that the John Hudnall who settled in Isle of Wight County, Virginia had a brother named Henry. 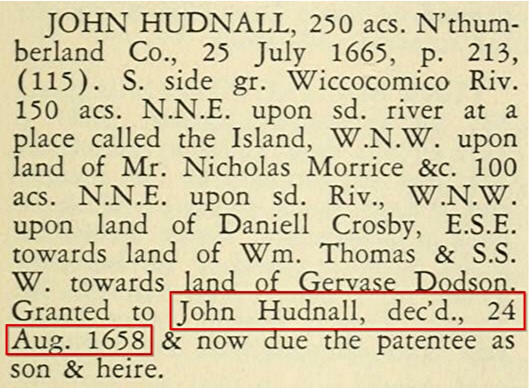 The John Hudnall born in 1606 had a brother named Henry. 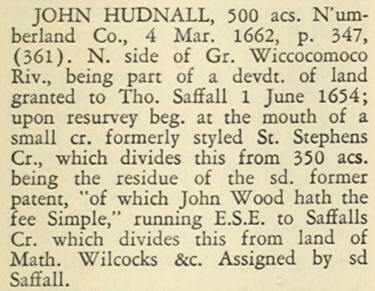 Therefore, John Hudnall, born in 1606, is the one that came to VIrginia. Family Search; IGI, Individual Record: Form submitted by a member of the LDS Church. Pearl White; Transcription of micro-fiche records for counties of England at LDS Family History Center, Alexandria, LA. Hudnall Records in England, by Richard C. Hudnall; submitted to LDS Library, Salt Lake City, UT. 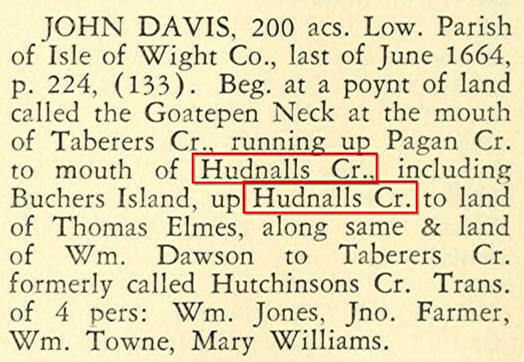 With no published ship passenger lists for the early 1600s and no records in the Isle of Wight Virginia Court House due to it burning down, the exact birth year of John Hudnall (I) may never be known. 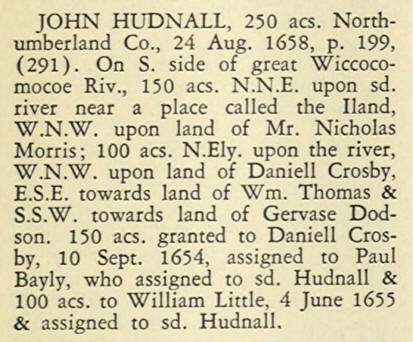 The John Hudnall (I) who came to America married Mary Webb in Northumberland County, Virginia about 1641 and is one of the first of this Hudnall line to settle in America. When John Hudnall purchased property in Northumberland County, Virginia, records indicate he came from Isle of Wight County, Virginia. There are several theories on the origin of the Hudnall name. Per GENUKI (a genealogy site for the United Kingdom and Ireland), "Hudnall derives from the old English Hudanheale meaning 'nook of land belonging to a man called Huda'." 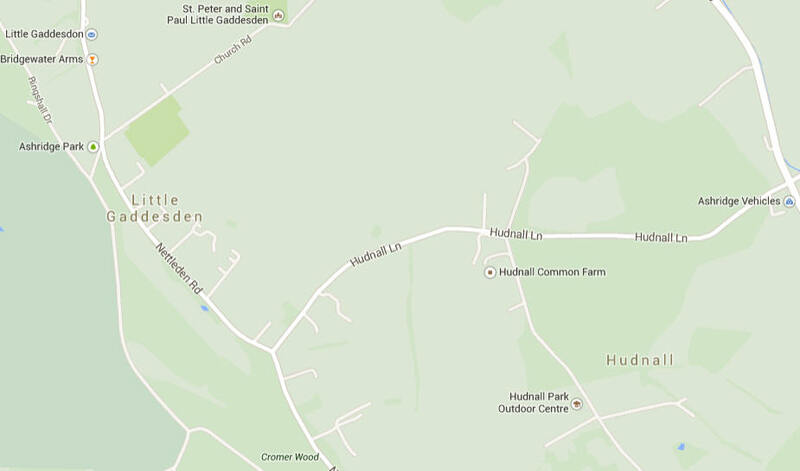 From Ancestry.com, the Hudnall name means "a habitational name from any of various place so called, such as Hudnall in Hertfordshire or Hudnalls in Gloucestershire, both named from the Old English personal name Huda (genitive Hudan) + Old English healh ‘nook’, ‘corner of land’." Although some speculate that John Hudnall had two wives, it is generally believed that John Hudnall only had one wife whose last name was Webb. Col. James Edmonds Saunders in his book "Early Settlers of Alabama," indicates her name was WEBB. Banks McLaurin, Jr. indicates her last name was PARTAIN. John and Mary Hudnall named of one of their sons Partain. Per "Married Well and Often: Marriages of the Northern Neck of Virginia, 1649-1800" by Robert K. Headley, Jr., Genealogy Publishing Co., Inc., 2003, Mary Hudnall, a widow, married Edward Sanders. Cited was a reference by Jenkins page 119, that her maiden name was Webb. 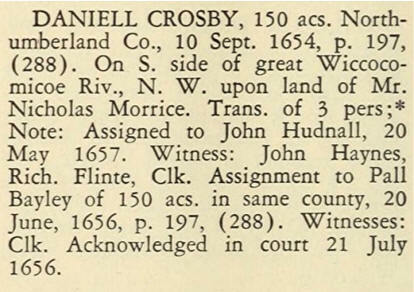 John Hudnall's widow, Mary, applied for a commission of administration for his estate (he died intestate) at the November Court in Northumberland County on 20 November, 1659. Per "Cavaliers and Pioneers Abstracts of Virginia Land Patents and Grants, 1623-1800", page 463, John is listed as deceased on 24 Aug 1658. At a Court held for ye County of Northumberland ye 20th of November 1659. "Upon the peticon of Mary Hudnall, the Widdowe & Relict of Jno Hudnall, deced., it is ordered that a Commission of Administration shal be granted unto her of the Estate of her deced. Husband, shee presenting an Inventory thereof to the Court and putting in security for the same." After Edward Sanders died, Mary married William Thomas (d.1678) after 1672. Because many of the early Hudnall descendants were given the same name, the son of John Hudnall (I) is referred to as John Hudnall (II) and his son is referred to John Hudnall (III). There is no documentation that they actually used those designations. It is used here to help delineate the generations. Three children of John Hudnall (III) are noted in the "Virginia Colonial Abstracts", published by Beverly Fleet in 1988 by the Genealogical Publishing Co. The abstracts were replublished from 34 paperback volumes. Per the will of John Hudnall (III), his wife, Judith, and 5 living children were heirs to his estate. The children mentioned were: Joseph, Frances, Alice, Nancy, Winifred and William. In the name of God, Amen. I, John Hudnall of Northumberland County in Virginia being sick & week of body but of perfect mind & memory thanks be to God do make & ordain this my last Will & Testament in manner & form following Imprimiss. I commend my soul to God & my body to the Earth to be decently buried at the discretion of my Executors hereafter named & as for my Temporal Estate wherewith it has pleased God to bestow on me after my just debts are paid I give & dispose as followeth. Item, I give unto my Son Joseph & my Daughter Francis Champion what estate I formerly have let them have. I give & bequeath unto my wife & my three youngest Daughters Alce, Nanncy & Winey my plantation whereon I now live for & during the space of fifteen years from the date hereof with all the appurtenances thereunto belonging except half the fruit trees which I give unto my Son William. I also give & bequeath unto my wife & my three youngest Daughters Alce, Nanncy & Winney all my other moveable Estate both Negros and other Personal Estate whatsover to be equally divided amongst them. I give & bequeath unto my son William Hudnall the land I bought of Mary McDayd granddaughter of John Bridgman & also the land I bought of John James on the proviso he lets my wife & three daughters above mentioned quiet & peaceable possession of the plantation I have now given them for the space of fifteen years as aforesaid. But in case my son William should disturb my wife & three daughters aforesaid of the plantation I have given them during the said term It is my will & desire that the land I have given him above mentioned shall go to my wife during her life & then equally divided among my three Daughters Alce, Nanncy & Winny & to them & their heirs forever. It is my will & desire that if my son William will swap his Negroe woman Nan for Jean he may have the liberty to do. I appoint my loving wife Judith my son William Hudnall and my friend Sam'l Blackwell to be executors of this my last Will & Testament. I desire my estate not be appraised. As witness my Hand & Seal this 23 November 1753. At a Court held for Northumberland County the 11th day of March 1754. This last Will and Testament of John Hudnall dec'd was presented in court by Judith Hudnall one of the executors therein named and the same being proved by the oaths of Sam'l Nelms & Spencer Haynie & George Humphries witnesses thereto is ordered to be recorded and on the motion of the said Executrix certificate is granted her for obtaining a Probat thereof in due form. Click on the following links to view Hudnall information collected by Carl Albert Edwards that focuses on the Hudnall families that migrated from South Carolina and settled in Louisiana. The PDF book is 156 pages with a number of obituaries and pictures. The Addendum is a collection of obituaries collected by Carl that are not included in the book.